The American Creed youth publishing project is designed to accompany the PBS documentary American Creed. Teachers, librarians, and youth mentors are invited to engage young people as they work towards responding to the film through writing, media, or art using any of the five invitations created by educators. Adults at schools and learning centers can create accounts for youth to publish their work to a national, or even international, audience. Letters to the Next President 2.0 engaged and connected over 18,000 young people, aged 13-18, as they researched, wrote, and made media to voice their opinions on issues that mattered to them in the 2016 presidential election. Letters to the Next President 2.0 was hosted by the National Writing Project and KQED, and included 20+ Educator Innovator partners. 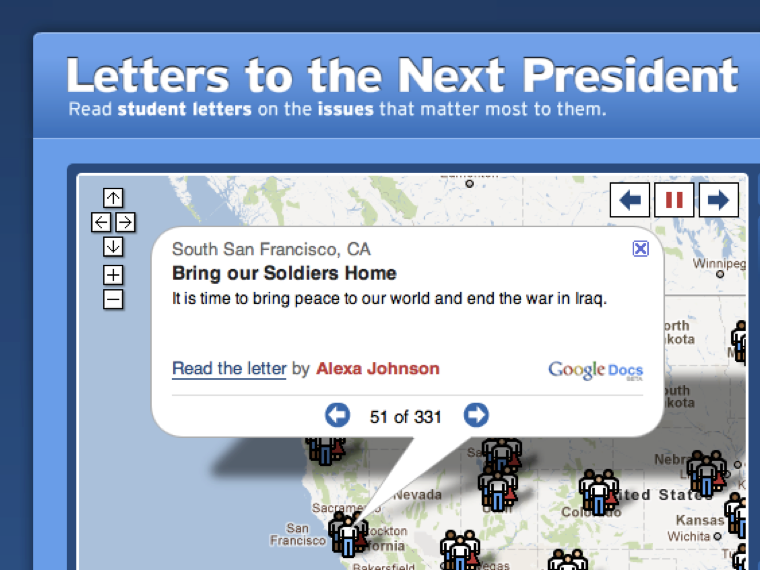 The original Letters to the Next President project was a collaboration between the National Writing Project and Google during the 2008 election. In 2008 over 10,000 young peopple from across 800 schools took up the challenge of identifying, researching, and writing publicly about issues that mattered to them, their families, and their communities. With support from teachers and mentors, the resulting websites, news coverage, and publications brought the voices of young people into the public discourse and invited young people around the country to write letters to the future president about their concerns, hopes, and perspectives. improve writing and learning for all learners.